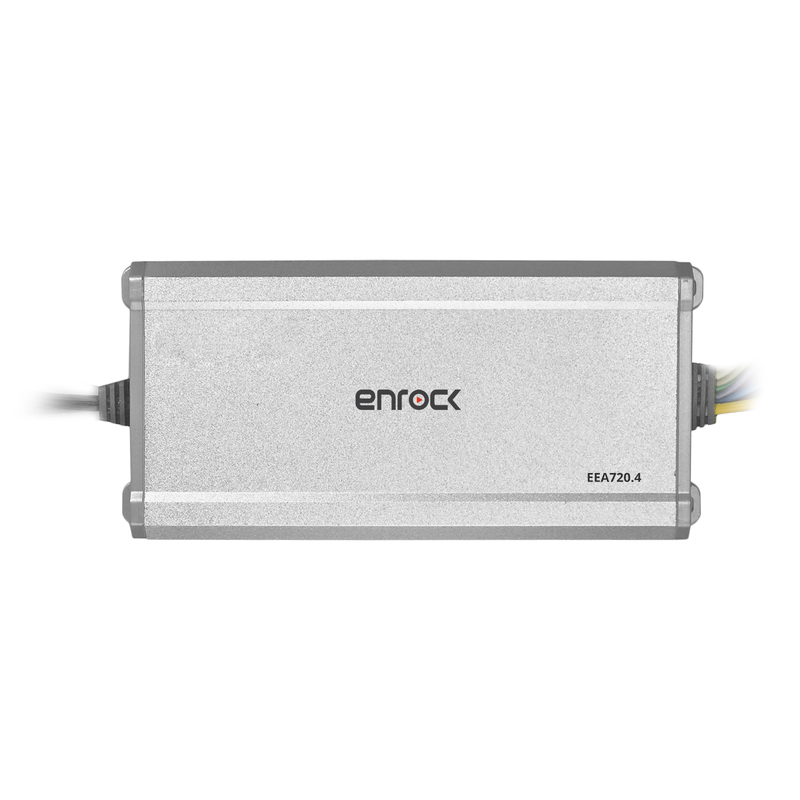 Enrocks EEA720.4 4-channel amplifier was designed compact yet rugged. The outdoors can be a tough spot for audio gear so Enrock considered the salt, spray and sunlight when designing this Class D amplifier. With 45 watts RMS per channel this amplifier will drive your speakers no matter the application you are using it for. It’s compact enough for a bike and powerful enough for a car. You’ll have no trouble hearing your tunes over the wind and waves with this powerful amplifier. 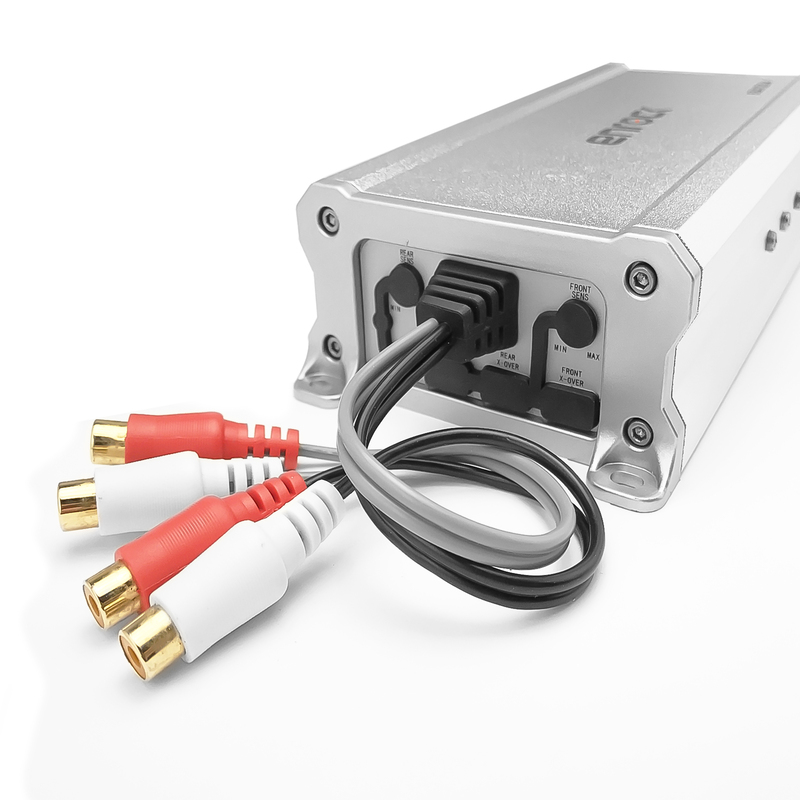 This compact amplifier will fit into a storage compartment on a boat, motorcycle, ATV, or car with optimal performance, despite its size. Should you decide to add a pair of subwoofers you can bridge this amp to a 2-channel mode and send 120 watts to each subwoofer, or switch to 3-channel mode to get a pair of speakers and a subwoofer. With high-pass and low-pass filters, plus bass boost, you can customize your sound output just the way you take your tunes. The amount of continuous power, measured in watts, that an amplifier produces is called RMS power. The higher the RMS figure, the louder and cleaner your music sounds. The range of RMS power the amplifier requires for operating safely and correctly. RMS Power Handling states the amount of power a speaker can handle on a continuous basis. Peak power is measured during a brief musical burst, such as a sudden drum accent. Some manufacturers display peak power ratings on the face of their products. The range of frequencies the amplifier will reproduce (lowest frequency to the highest). For full-range speakers, the wider the range, the better. Optimal is 20 - 20,000 Hz, the range of human hearing. Measured in decibels (dB), this spec compares the strength of the desired signal (music) to the level of background noise. A higher value indicates less background noise. This spec tells you how much more power your amp delivers when presented with a 2-ohm load. You can achieve a 2-ohm load by using two 4-ohm subs wired in parallel, or by using a 2-ohm sub. Useful if you're adding an amp to a factory radio, or don't have enough preamp outputs on your aftermarket receiver. Speaker Level Input Types: Harness, Speaker Terminal, RCA. Authorized to sell this product. Dimensions of the outer box of the product.